After my last blog we went into a 10 day exercise which saw us working with the Turkish, Dutch, and US Navy. On board the Ocean we saw even more integration when members of the RAF Chinook squadron joined us. While also having the Green Sea Kings of 845 this reduced our deck space to next to nothing, so being ever eager to fly, we 820 found alternate ways of operating our aircraft. 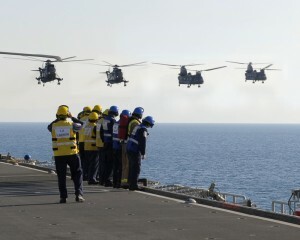 During busy periods of flying for team green we flew over to RFA Wave Ruler and operated from its flight deck. I must say there weren’t many upset faces when we were told we would be staying on a different ship over night, especially the fact they have single man cabins and have some of the friendliest people at sea ive ever met. Before long the exercise was over and we said goodbye to 845, the RAF and 40 Commando. It is nice to have a more relaxed ship atmosphere again; it was very manic having all those extra people on board, it’s nice not having to cue up for the showers and for dinner. As usual we were rewarded for our hard work with another run ashore, this time we went to Izmir, Turkey. Having already been to Turkey on this trip, we were very familiar with some of the practices of the locals which made this stop very smooth, with very few problems. Izmir was very nice, it’s a large city overlooking a bay, in the evening lots of locals walk and relax at a park which lines the bay with plenty of grass we took the opportunity of sit down with a few drinks and enjoy the sundowners experience. We got to see a few of the Ruins in Izmir, even though it was on accident as we were looking for a shopping centre by the same name. As with all stops so far the ship had organized a few recreational visits one was to visit Troy and Gallipoli which involved staying in a very nice hotel overnight, all that went said it was very enjoyable. 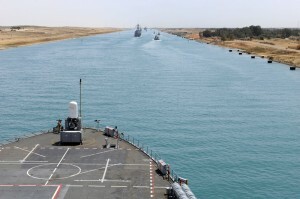 On completion of our stop we were back to work, having a few days flying just getting everyone back into the rhythm of things then we had to stop everything for our transition through the Suez Canal. There were a couple of time I looked outside which really gave me an idea of how narrow the canal is, as you can see from the photo. Once we were through the canal and into the Red Sea the difference in temperature to the med was staggering, in Turkey it was 17’c daily temp, now its 33’c, were loving it. It’s not quite up to the temperature were used when we go to the desert but it’s a very welcomed change. 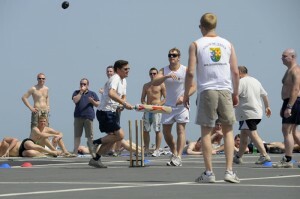 To celebrate this the PO PTI organised a game of flight deck cricket which involved the entire ships company. The pic is of me and my team making the skipper (with the bat) run lap after lap, good times, sorry Sir. Those that weren’t playing cricket either sunbathed or played touch rugby; a great day was had by all. There are a few people suffering even days after the event, sun burn which has now turned into peeling, but it’s the price you pay for a good time. Related to 820, Merlin, Ricky Fairlamb, Taurus 09.